Don't panic, there are no tigers of any colour roaming the Suffolk countryside, or UK for that matter. No, the green tiger I was after was the Green Tiger Beetle Cicindela campestris. It all started at the start of April, whilst I was looking round my local patch, Purdis Heath. In the sandier parts of the heath, I kept coming across these little mounds of soil with a hole in the middle. The 50p is for scale purposes only, otherwise I'd be rich if there was a 50p next to every hole! I took the above photo and shared it out amongst the twitteratti asking if anyone could give me an idea as to what made the little hole. I must admit, my first thoughts was a solitary miner bee, and others too had the same idea. Several others came up with bumblebee hibernacula which was also possible. But then someone (Graham from Diss) mentioned a digger wasp (another likely) or Tiger beetle! 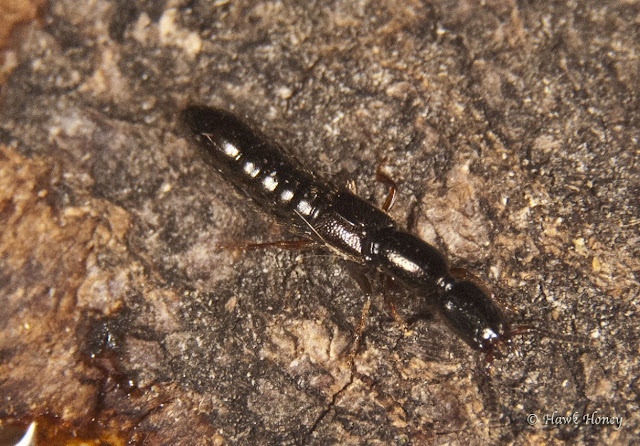 This grabbed my attention and soon I was searching to find any records for Tiger beetles at this site. 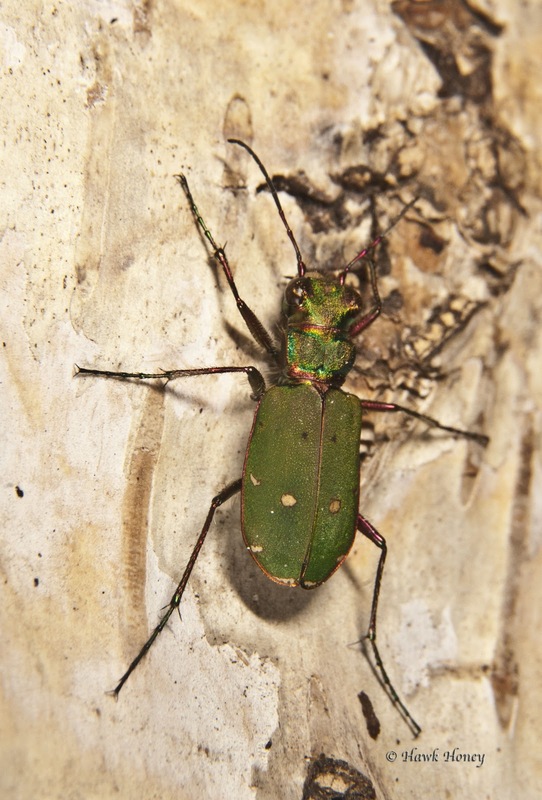 It wasn't long before I came across a random webpage that had a list of invertebrates of Purdis Heath and there it was, halfway down, Green Tiger Beetle. Joy! There's a reason for this joy, a couple of years ago, me and the wifey were holidaying in the beautiful countryside of west Scotland. One particular day we went off in search of fossils and on the way we came across one of these beetles and I've never forgotten it. So to find out that they are here on my own doorstep was great and a tiger hunt was planned. I know these creatures are sun worshippers, so the weather had to be good for me to find one and this weekend was looking great. I was planning to go out on the Saturday, but jobs at home got the better of me and I put the 'expedition' off till Sunday. So armed with all my kit, off I went in search of tigers. I arrived at the heath with a clear blue sky above me and a warming sun doing its best to beat through a slightly chilly wind, with temperatures getting up to only about 14ºC. I made my way to the sandy area of the heath admiring all the work done by the volunteer work parties in creating dead hedges and habitat piles and removing the encroaching deciduous trees in the process. I know these beetles like to hunt their prey by running after them, in fact the Green Tiger Beetle is one of the fastest runners in the insect world so some books say, so this habitat, with little vegetation to get in the way, would be perfect for a Tiger beetle. The habitat favoured by the Green Tiger beetle. It wasn’t long before I noticed, that as I crept along slowly keeping an eye out for my prey, they had already spotted me by miles (insect miles that is) off. Every now and then, 10 -15 foot in front of me I would see what at first I thought was a fly, take off and fly a short distance further away. 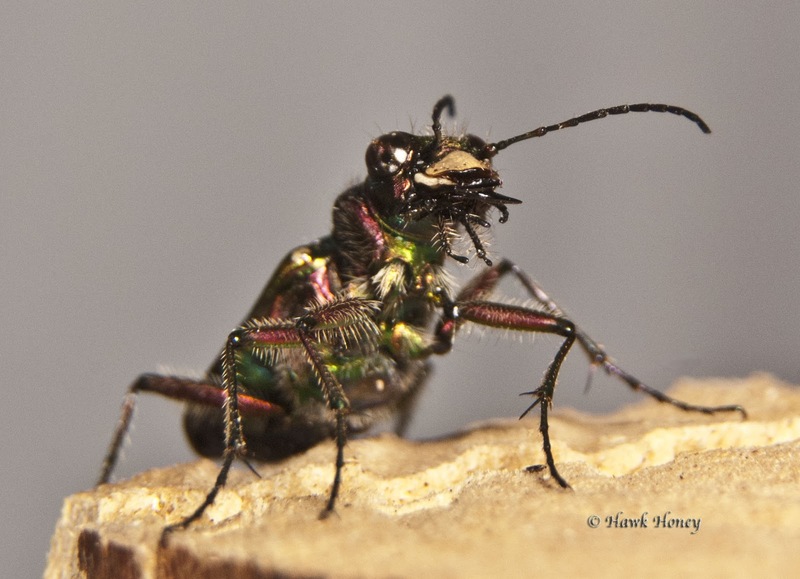 I then noticed as I watched one fly off, and hint of bright green as the sun reflected off of its elytra, TIGER BEETLE! So I now knew I was in the right area, now I just had to catch one. It seemed now, that with every step I took, just ahead of me half a dozen would launch skyward to avoid the swish of my insect net. A different approach was needed, so I thought about running into the area to swipe at anything that launched in the exodus to avoid my size 10’s bearing down on them. This failed as the evacuation was even more faster than I could run, maybe because I caused an insect earthquake with my running, that they literally heard me before they saw me. So back to the drawing board and my next plan was to crouch down to minimize my 6 foot frame and walk as slowly and as gently as possible, not easy in that position. This seemed to have a improved my chances as they took off a bit later than before, although they were still very quick. Then I got lucky, a beetle took off straight into the branch of some vegetation and fell to the floor below. As quick as I could without a second's hesitation I brought the net down above the branch to trap the beetle below. Mistake. In my eagerness I failed to notice that the branch of vegetation was a very prickly branch of a bramble bush which very readily snagged my insect net allowing the beetle to casually walk off (I’m sure I heard it snigger). This left me having to walk back the 200yds to my bag to collect my knife, a very dangerous move in my books. For whenever I usually get my knife out, it is usually accompanied by Wifey running into the kitchen to return with the first aid kit, as it is usually pretty common for me to lacerate myself, often quite deeply, with any sharp object I choose to wield. However, in this instance Wifey was not around and the first aid kit was quite some distance away in the car. I made some quick back of the envelope calculations as to how far I could get before blood loss caused me to pass out and thought the risk was negligible. So chopping of the bramble and freeing my net, without incident, I started again and it wasn’t long before I got my prized beetle in the bag (well, pot actually). As you can see and I’m sure you’ll agree, it was well worth the effort. Here’s what makes this lovely looking beetle such an effective and formidable hunter. 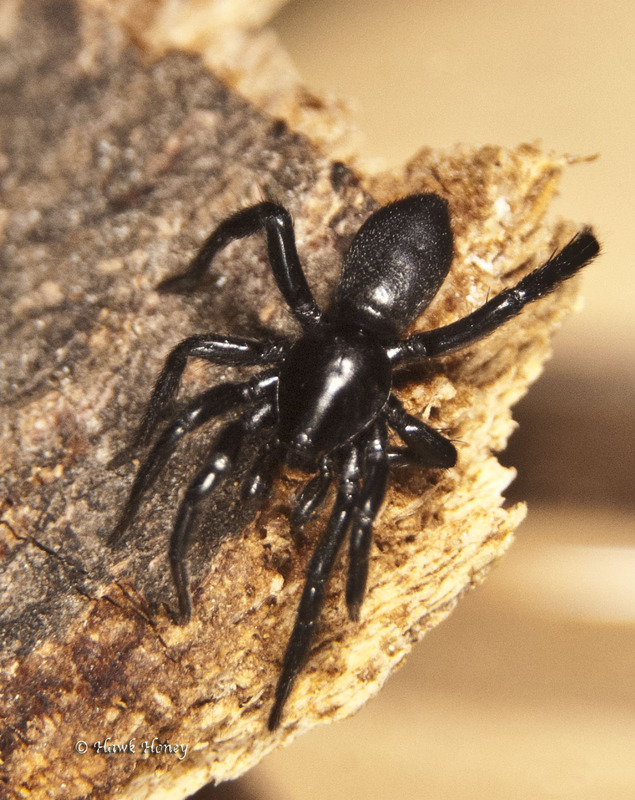 Look at those powerful, black tipped jaws, the long legs, which gives it its speed and those large raised eyes, which gives it its excellent all round vision, the main reason it saw me before I saw it. C campestris looking like some thing from a 50's B movie. Note the huge black tipped mandibles and large eyes. The iridescent colours around its head and thorax are quite beautiful and I’m so glad I got to see this little creature again to grab a photo. Of course, this wasn’t the only thing I came across that day. I found this little fellow wandering across the path in front of me. It’s what’s known as a Rove beetle and you would be forgiven for thinking it was a Devil’s Coach Horse, which is also a Rove beetle. However, this one was much smaller and a little harder to ID, but thanks to the good people of twitter ( esp @bigbugtel), an ID was made as Xantholinus linearis. Unfortunately, it doesn't have a common name. I did make a few other finds that day, such as a Jay Garrulus glandarius a small solitary miner bee, which I have yet to get an ID on (I'm working on it). I also came across a bird that was flushed by a dog. I followed to where I saw it land and although I couldn't see the bird, I could hear it. Now unfortunately, I can't post audio to this blog (or I haven't worked out how to do it yet) and even more ironically, I can't share my recording by Twitter. So until I see some of my bird orientated friends to play my recording to, the ID will have to wait. 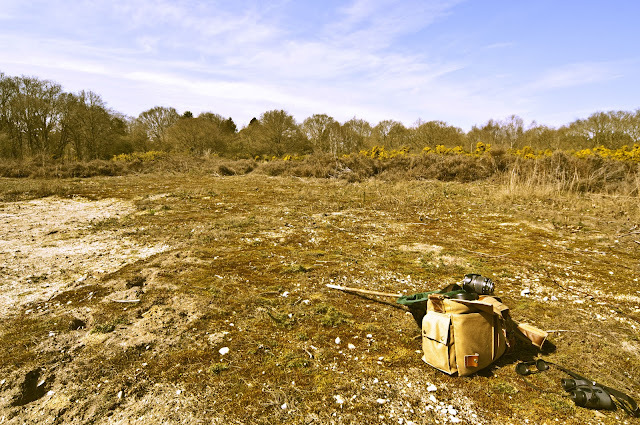 I saw some other little birds here and there around the heath, but as you know, birds ain't my bag dude!!! I also clocked 3 tortoiseshell butterflies and 2 comma's, yes it was a glorious day that Sunday and I discovered so much in just a couple of hours including one last item, a spider! It was a tiny weeny little spider, but it does have a sinister look about it, so those of a nervous disposition look away now! Zelotes latreillei Again, no common name. That's it for now, next time I hope to be off hunting adders and I'm not talking about good mathematicians. Hi, thanks for the mention. You will probably like Lee Chadwicks, In search of heathland. It's about the Suffolk Sandlings with lots on invertebrates. Cheers, Graham.